On Friday (31st August) I was at eAssessment Scotland 2012. This is an event I’ve had a long running involvement with and it’s always a pleasure to travel up to Dundee with around 300 other delegates to attend one of the premier eAssessment events in the UK (if not Europe the world). Sheila was also at the conference at has already posted some notes and there isn’t much for me to add (although I do want to write something on Open Badges after attending Doug Belshaw’s session). Instead I wanted to have a quick look at the conference twitter backchannel. 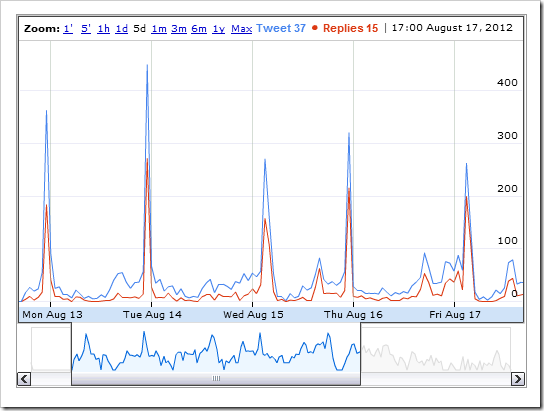 The archive of 1196 tweets taken between 23rd August and 3rd September has contributions from 184 twitter accounts. 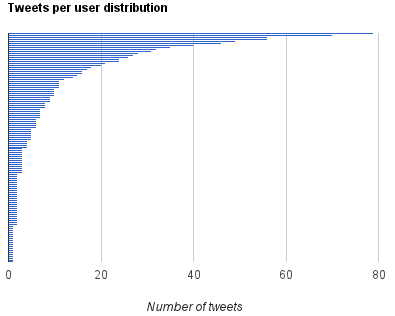 The median number of tweets per account was 2. 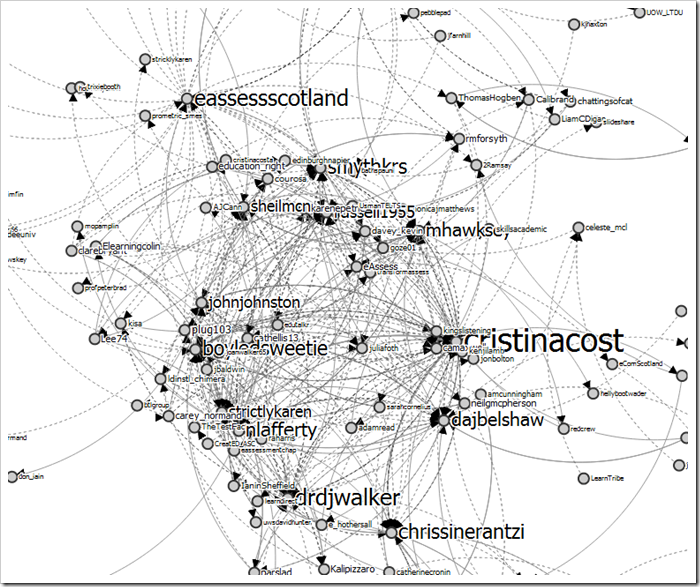 As well as monitoring the number of tweets being posted during the day, following on from my work on analysing threaded Twitter discussions from large archives using NodeXL #moocmooc, I included the number threaded replies* in the archive. 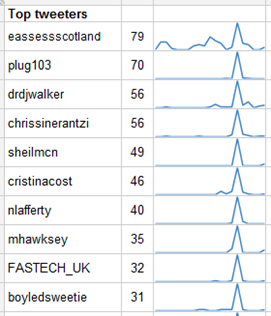 Of the 1,196 #eas12 tweets 10% (n.115) were threaded replies. I was able to monitor this in real-time with the graph below which is embedded in the dashboard. *the metadata from Twitter includes a ‘in reply to id’ field which identifies if the tweet is part of a thread. This isn’t 100% accurate as it is only recorded if the user uses a reply button. So how does this compare with #moocmooc. Hopefully the graph below illustrates this (interactive version here), but in numbers the ‘#moocmooc archive contains 6,883 tweets where 44% (n.3046) are conversation threads. 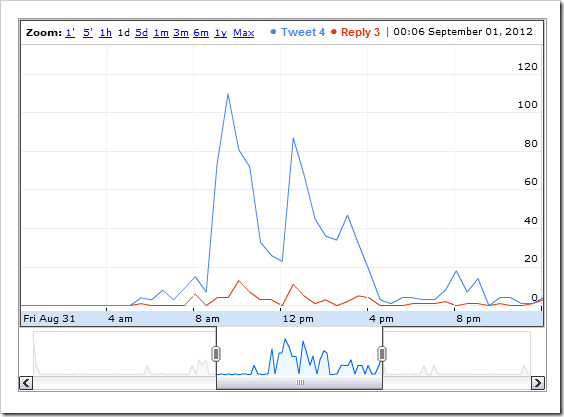 It’s perhaps not surprising that different modes of twitter usage produce different conversation patterns. Next week I’ll be at ALT-C 2012 in Manchester where I’ll also be monitoring the twitter backchannel. This is a 3 day event aimed at learning technologists so it’ll be interesting to see if a different pattern of usage emerges. Something else I’m reminded preparing the TAGSExplorer view of eas12 (graph of replies – solid lines, and in this case mentions – dashed lines, between twitter account using eas12 hashtag) is that there is more interaction going on that could be analysed (there’s a PhD in all of this – if Twitter keep the data flowing). I also think of twitter as a bit of a notebook too – particularly as thanks to some of your previous spreadsheet archives I can find them again. Looking forward to discussing this more with you. Hi Sheila – Alan’s comment is interesting as it points to mode and medium. Sticking with Twitter for now the behaviour seems to fit the medium. One of the reasons I’m interested to track this at ALT-C is unlike eAS the keynotes are going to be streamed live. Will the remote audience be more conversant??? My feeling is that broadcast mode is related to the massification of twitter, the price we pay for it becoming a channel rather than a chat. Time for a new tool if you value quality then? I’m not sure if it a problem with the massification of twitter, but might be related to the way twitter works. Reflecting on my experience at Google I/O where I was mainly contributing to the conversation via Google+ it was interesting that it felt more conversational because it was easy for people to review and comment on G+ posts. 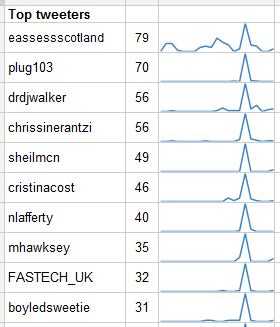 It’ll be interesting to also monitor Google+ at #altc2012 to see if there are any trends. Thanks for this, it is thought-provoking. I think Sheila’s comment about Twitter being a notebook is probably very pertinent to conferences. It is useful to look back on one’s own tweets and I often use them for writing up the event (eg http://lrt.mmu.ac.uk/traffic/eas12-conference-dundee/) and if tweets are Storified later, giving a handy meta-notebook, then that’s even better because you have other perspectives. Plus, if you are following the stream rather than attending in person, getting a sense of what others think is important adds to the value, so if I do go to things in person I try to tweet with that in mind. As one is often using a mobile device for on-the-spot tweeting it can be difficult to keep up with what others are saying about the same conference, so replies are something for later catching up. I don’t know – I have no data – there is definitely a (mixed methods) PhD in it! Mobile wasn’t something I’d considered. The data collected by twitter on where someone tweeted from isn’t conclusive (Twitter for iPhone = mobile, web = desktop or mobile) A quick scan of the archive would suggest the majority of tweets are mobile so I’d imagine it’s a factor. I’m even more intrigued as to how alt-c will go down. Firstly, I’m new at all this academic stuff so I definitely don’t have the confidence to offer opinion-as-fact. Secondly, I really *try* to report / quote rather than really offer thoughts (only the brave watch a live feed as they present…). Thirdly, it is a good conversational backchannel but points about the difficulties of tracking conversations in Twitter are definitely relevant here (and I am thinking about giving G a go next time. Without my laptop and several apps tracking tweets, it wouldn’t be as rich an event). Fourthly, there is a publicity thing going on – I am definitely aware of the fact that I am broadcasting and that this is putting me in touch with other people (it’s like the old diary thing – it is private, but most people don’t write a diary for themselves…). Fifthly, admit it – it’s like passing notes in class. Sixthly, there is an element of being with the in-crowd – twitter’s doing the job just now and quite a few people are using it actively and it is interesting to be part of that. A final observation would be the #bimacademy conference I just attended where, at the start, I was the only one tweeting. By the end we had a pretty decent group of internal *and external* tweeps. This has generated another micro-community and it will be interesting to see what happens to that (i.e. not just the internal effect). The very nature of the medium leads to a very transient, emergent behaviour – sometimes it’s good, sometimes it’s not.